Maureen Walsh (CEO of DeCare Dental) presenting the cheque to Richard Flaherty (CEO Cancer Care West), along with the DeCare charity of the year committee and David O'Donnell, regional fundraising manager of Cancer Care West. 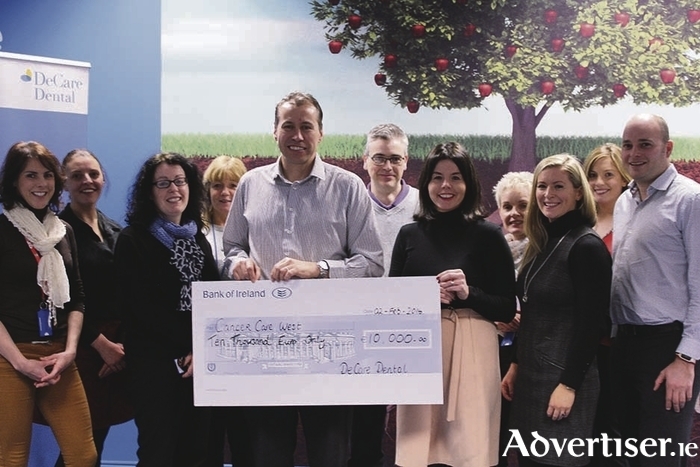 DeCare Dental’s Charity of the Year committee recently presented a cheque of €10,000 to Cancer Care West. Cancer Care West was DeCare’s 2015 chosen charity as nominated by DeCare’s employees and the proceeds of all fundraising activities throughout the year went to this very worthy west of Ireland charity which provides support to cancer patients in the region. Employees of DeCare Dental, Ireland’s only specialist dental insurer, based in Claremorris, got together to organise events such as the annual Sport a Smile fun run, a country dance, bake sales, and bag packing. DeCare’s Charity of the Year committee would like to thank DeCare Dental’s employees, local businesses, and the local community for supporting DeCare’s fundraising campaign last year. Plans are well under way for another successful year of fundraising in DeCare Dental.